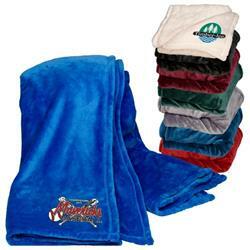 The Ultra-Plush Blanket with custom embroidery is an extra soft, extra cuddly blanket that will become your new best friend on those cold days or nights. Made with 100% polyester super-soft 300GSM faux mink fabric and machine washable it also makes a great holiday gift for friends and family. 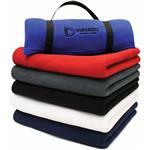 Includes custom embroidery up to 7,500 stitches and 7 colors! Production Times Available: Standard 7-10 Day Production with Paper Proof. 100% polyester super-soft 300GSM faux mink fabric, Machine washable, Packaging: Zippered Vinyl Carry Bag. Custom embroidered heavyweight blanket. 50 inches x 60 inches.